Custom Fire Pit with fire retardant insert. Veneered in East West Stone – Honey Gold color – with Rainbow Stone cap. 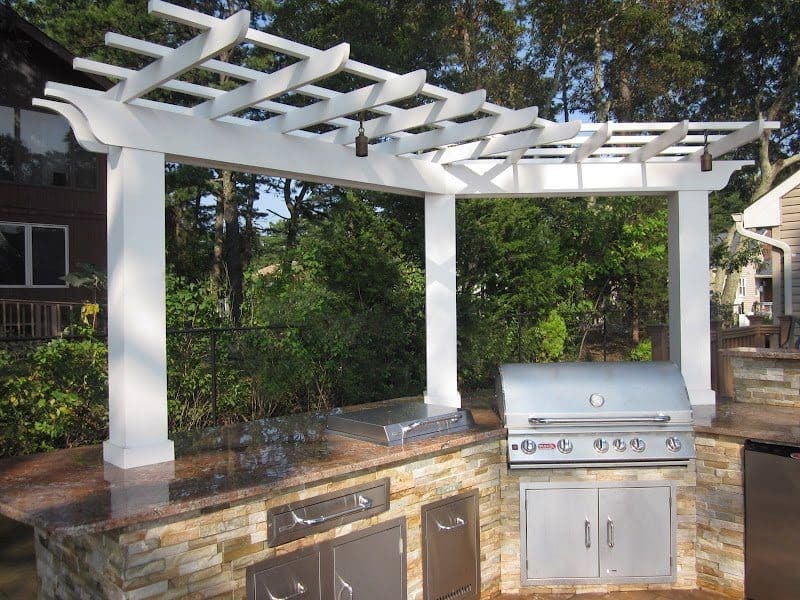 Outdoor Kitchen with dual Bar Top featuring outdoor fridge, sink, and access doors. Granite Countertop veneered with East West Stone – Honey Gold color. Outdoor Kitchen with 38″ Brahman Grill, access doors, warming draws, dual Bar Top featuring outdoor fridge, sink. Maintenance free Azek Pergola with recessed low voltage lighting. Granite Countertop veneered with East West Stone – Honey Gold color.